The truth is, I’m not anti-marriage. One day I hope to find someone I love enough to want to spend the rest of my life with — and hopefully she’ll feel the same way about me. But until that happens, I’m a perpetual third- or fifth-wheel. And admittedly, I go back and forth between being alright about it and yes, being lonely. Kind of like Bobby, the lead character in Stephen Sondheim’s Company. 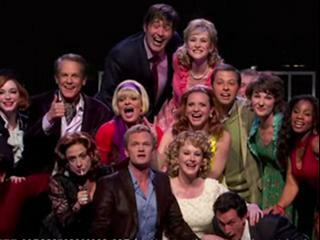 The classic musical, one of my all-time favorites, was recently revived in New York with a cast including Neil Patrick Harris, Stephen Colbert, Patti LuPone, Jon Cryer, and Christina Hendricks, and for a brief time, you can watch a recording of those performances on the big screen. The show is awesome for a number of reasons, one of them being Sondheim’s songs, which at times have such a contemptuous attitude toward married people, and at times hit the single person’s conflicted attitude toward settling down right on the nose. The show is funny, thought provoking, insightful, and not the typical “jazz hands” kind of musical. And as a 37-year-old singleton, I can identify with a lot of it. 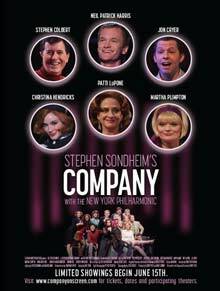 The last time I saw Company, five years ago, the show left a real impression on me. So any future productions get measured against that one. This one just didn’t have that same effect. Produced by the New York Philharmonic, the draw here was certainly the cast. However, the talent across the board was mixed. Harris makes for a truly charming Bobby; it’s not hard to see why all these people would love him. He’s more than capable of carrying the show, and his performance is eager to please. 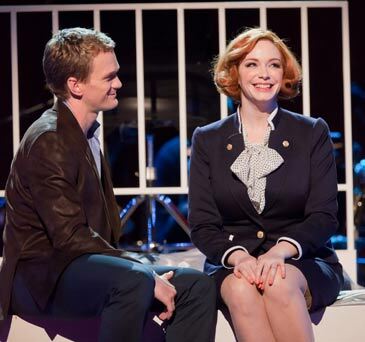 The problem is that while Harris has a fine singing voice, it’s just not as strong as the character requires. For example, “Marry Me a Little” was fine, but “Someone Is Waiting” sounded like it was more of a challenge. Among his co-stars, the acting was good, but again, singing was the real problem. Songs like “You Could Drive a Person Crazy” sounded off, and, well, Cryer, Colbert, and Hendricks aren’t known for their singing anyway. 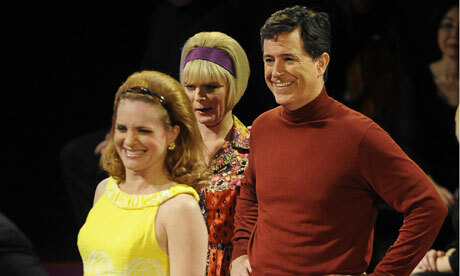 Better were Martha Plimpton and especially Kate Finneran, whose “Not Getting Married” was one of the show’s highlights. And then there was LuPone, whose performance was the best of the lot, not surprisingly. “The Ladies Who Lunch” was definitely the show’s peak. In addition, the show felt long and it dragged at times. I seem to recall the 2006 revival using an abbreviated book, and this production had no such tweaks. Also, the recording was basically a video of the show and not a high def film, which made watching the show on screen instead of live less engaging and fun. It wasn’t exactly a home video, and it wasn’t a film either. I never knew if I should be applauding, even though that seemed to be the natural reaction. So is it worth finding a theater showing Company in the next couple days? Perhaps only if you’re a devoted fan. Otherwise, check out the well produced DVD from the much more elegant 2006 revival.